The only Rainbow album I owned until about 1982 was the very first one simply titled, Ritchie Blackmore's Rainbow. It was released in 1975 and although had some great tracks, the production wasn't that great and being a huge Deep Purple fan, didn't really impress me too much. About 6 or 7 years later, I heard Stargazer on FM radio and it blew me away....what an amazing epic song!! I immediately went out and bought the Rising album. Less than a week later, I was out buying Long Live Rock and Roll. I had never heard anything off those albums and it was apparent that I had missed out on 2 very excellent and classic albums. 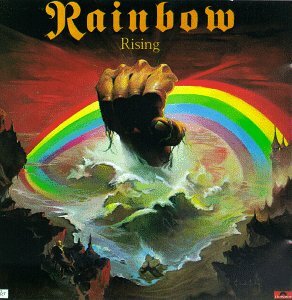 I think Rainbow really started to hit their stride with Rising. It stands out today as one of the most classic and influential Hard Rock albums ever made. Even the cover is very reminiscent of some of the covers by today's new breed of Epic and True Metal bands. A lot of people were disappointed when Ritchie Blackmore left Deep Purple, but the results with his new band far exceeded what Deep Purple released in his absence. I think the lineup for this album was the best Ritchie ever assembled as well. It consisted of Ritchie Blackmore, guitar, Ronnie James Dio, vocals, Jimmy Bain, bass (still with Dio today), Cozy Powell (R.I.P. ), drums and Tony Carey, keyboards. The production was far superior to the first Rainbow album and the songwriting was very slick, more coherent and very much more uptempo (it rocks!!!). Tarot Woman begins with a wild and dreamy synthesizer passage, followed by Ritchie's guitar fading in. Eventually, the entire band crashes into a great charging uptempo and instantly classic Rainbow song. The music just cooks and the vocals and chorus outstanding. I knew when I first heard this track that this was going to be a great album!! This song sets the stage for the rest of the album and uses a few songwriting twists that Dio still uses today. He writes a verse section, then goes into a pre-chorus, then the chorus. The choruses of most of his songs mainly consist of a few words, usually the song title (i.e Stand Up And Shout, Holy Diver etc.). A new era in Hard Rock Music was born. Run With The Wolf is a more slower trudging style of beat again with great vocals and the pre-chorus/chorus arrangement. The track reminds me a bit of Sail Away from Deep Purple's Burn album. A very catchy tune and Cozy Powell uses a very loose drumming style in which he's tight with the band but throws in lots of fills. Starstruck is bluesy and more Deep Purple style than most of the other tracks, again with an awesome chorus and I think is one of the best riff-driven songs Ritchie Blackmore has ever written. Do You Close Your Eyes is a more simpler straight ahead rock tune in which the song is built around a great but simple guitar riff. Ronnie's vocals really add to the rocking tempo of this track and his choice of lyrics to fit the tempo and the main riff to the song is simply flawless. Stargazer....my favorite....I think this song still contains one of Ronnie James Dio's best vocal performances ever period...end of story....say no more!! A wild and dreamy intro leads into a classic slow heavy Ritchie Blackmore riff. This is an awesome epic track with Led Zeppelin - Kashmir like orchestration and stunning and extremely passionate vocals. The lyrics are amazing and pure epic fantasy. It tells a story of an evil wizard who enslaves a race of people to build a tower of stone in the middle of the desert so he can fly to the stars. When the tower is finished, he tries to fly but simply crashes to the ground leaving all the people he enslaved to fend for themselves. A very symbollic story line drawing parallels with ancient as well as modern history. The mid section contains some great leads and the ending of the song just incredible. Dio delivers an amazingly emotional and almost pleading vocal right through to the fade out of the song. You get the impression that he was giving it all he had for the final recorded version of this song. A masterpiece and still one of my all-time favorite songs. A Light In The Black...a close second for best all round track, is a very fast track and faster than almost anything Ritchie ever did with Deep Purple (except maybe Speed King or Burn). He uses some great guitar riffs and some cool abrupt stops to propel this really charged up song. Once again, the chorus is awesome and Cozy Powell delivers some cool double bass drumming fills (something not heard too much way back then!!). Mid song there's some great guitar and synthesizer lead trade-offs very much like in Burn by Deep Purple and the overdubbed and double-tracked leads by Ritchie are real stand-outs. A killer and very fast track and also an amazing way to end an awesome album. This album really broke new ground in the realms of Hard Rock music. It combines stunning riff driven songwriting with epic fantasy style lyrics and uses some classical music influences in some of the song structures. The whole album has a driving energy and an atmosphere that was never really duplicated again. Long Live Rock And Roll is also a great album, but contains many different styles and some ballads (no ballads on Rising at all!!). This approach to hard rock music seemed to be all but lost until people like Yngwie Malmsteen in the mid 80's and eventually bands like Stratovarius in the 90's and today, realized the power of the music Rainbow created and began experimenting with that type of sound, expanding it into something fresh and new. Lots of new metal bands are using keyboards again to really enhance their sound and create a different style and feel than what we were accustomed to in the 80's and 90's. It's like the door was left open for bands to come along later to pick up where Rainbow left off to further advance this type of sound and approach to making exciting and very interesting metal music.